The 55.08 metre classic sailing yacht Shenandoah of Sark has had a central agency change and is now listed for sale by Tim Carbury and Georges Bourgoignie at Fraser. Built entirely in steel by US yard Townsend & Downey to a design by Theodore E Ferris, Shenandoah of Sark was delivered in 1902 and completely modernised in a 2009 refit. Accommodation is for up to 10 guests in four cabins comprising a master suite and three doubles plus two Pullman berths, all with entertainment centres and en-suite bathroom facilities. A further six cabins sleep 11 crew aboard this yacht for sale. The magnificent main saloon has a three-part custom gimbal table which offers dining for up to 10 guests as well as a large L-shaped sofa for six people who wish to relax after dinner while being treated to music on the Steinway mini grand piano. For added entertainment, there is a 55-inch Samsung 3D LED television screen, a Linn stereo system and an Apple media server, controlled wirelessly through an iPad. Natural light and ventilation are provided by a large skylight. On deck, the cockpit offers a comfortable and safe area to enjoy a day’s sailing in comfort and for a delightful al fresco dining experience for up to 10 guests. Her fine and sea kindly hull has already graced the waters of the Pacific, the Antarctic, the North Atlantic and many more. Under power, two Lugger 500hp diesel engines allow a range of 3,400 nautical miles at her cruising speed of 9.5 knots. 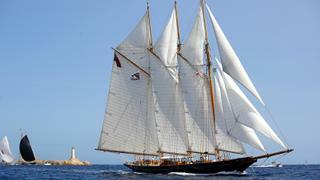 Lying in Palma de Mallorca, Shenandoah of Sark is asking €11,000,000 with VAT paid.